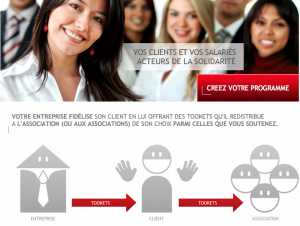 A Credit Union in France just announced the opening of a new online agency called Tookam. Besides a number of innovation related to social networks, the new agency provides a virtual currency that helps businesses engage their customers with charitable rewards, that is: rewards that can be turned into donation in government money to a charity chosen by both the business and the customer. The business establishes a rewards program in Tookets and pre-defines a number of charities that the tookets can be converted in Euros and donated to. Customer earns the tookets as they do transactions with the business. The customer can then turn some of the tookets into Euros and donate them to one of the charities pre-selected by the business. What’s interesting here is the alignment of values that it creates between the business and the customer. By looking at the list of charities that the business’ rewards program support, the customer can decide whether to increase or stop shopping at this particular business. This program fits in the larger trend of rewarding real-life purchases with virtual currency. By defining what their rewards currency can be converted in, the business has another opportunity to express their mission and connect meaningfully with their customers. There is no reason that this model be limited to charities: rewards could for instance be converted to donations to specific projects, such as the ones found on SpotUs or Kickstarter. Thanks for the post. It is really a very new and unique concept. Thank you very much for educating us all about this new and amazing concept.